When Hilton Worldwide announced plans for an electric vehicle charging program in partnership with Tesla and GE, Greg Rowell, General Manager of Hilton Garden Inn State College, took notice. Rowell concluded that offering this new cutting-edge amenity for guests to customize their stay more than ever, tied in perfectly with being a “green hotel”. 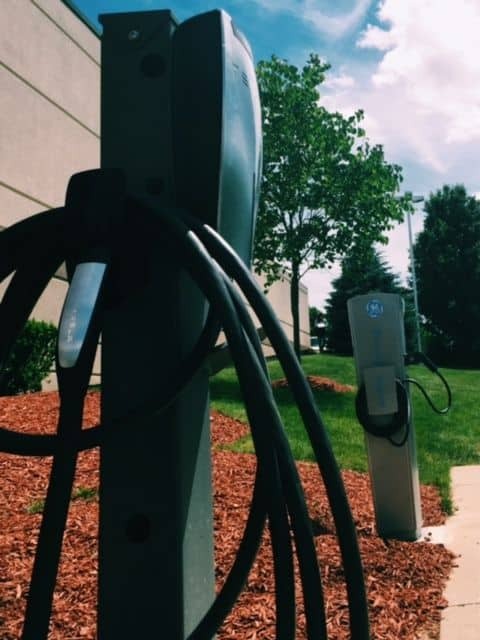 The Hilton Garden Inn, located at 1221 E. College Avenue in State College, Pennsylvania, has a Tesla Connector for charging Model S or Model X cars and a GE charging station with a universal J-1772 connector that can charge any production electric vehicle. "We love being able to make the travel process easier for a growing number of our guests," said Rowell. “Our goal is to support our guests in their travels no matter what technology they are using. Providing hotel guests with even more choices to manage their environmental footprint is just one more way that Hilton is incorporating responsible business options into the guest experience." The Hilton Garden Inn State College is a 103 room hotel offering spacious guestrooms and suites close to the Penn State campus. It is managed by Hospitality Asset Management Company of State College who also recently opened the Comfort Inn PA Turnpike in Carlisle, Pennsylvania and the soon to open Hilton Garden Inn on the Indiana University of Pennsylvania campus. Both new properties are proud to announce that they are approved for the new charging stations and will be available for guest use in the near future. Electric vehicle sales have increased dramatically in the last few years as the number of affordable vehicle options have increased. Since 2010, more than 455,000 EV's have been sold in the U.S. and over 49,000 in 2016 as of May, according to InsideEVs Monthly Scorecard. In Carlisle, their operations include the Comfort Suites, Comfort Inn and 1794 The Whiskey Rebellion. In State College, they manage the Days Inn Penn State, the Hilton Garden Inn, the Super 8, the Quality Inn, the Nittany Budget Motel and the AAA Four Diamond Carnegie Inn & Spa, Gigi’s Southern Table, and the Carnegie Inn & Spa Fine Dining. In Indiana, they manage the Hilton Garden Inn on the campus of IUP, along with CH Fields Craft Kitchen.